Well, it’s been a few weeks and I’ve made it back to Birmingham for a quick refresher session ahead of my test tomorrow. As I’m up here mid week, it’s not Lichfield I’m going to test at but the South Yardley centre in Birmingham – near Heartlands and Solihull, so I have a whole new area to learn in a day and a half. I got to the centre knowing Mark was going to be looking after me today with Chris the man to take me to test again – if his nerves can cope! After a bit of a catch up from the past couple of weeks it was time to get kitted up and head out to the pad to have a quick ride around before going out on the road. To my horror I thought I’d forgotten everything I’d learnt. I couldn’t work out why I couldn’t get Kay, my Suzuki Van Van who I’d used just over two weeks ago, moving. I calmed down and did get going and firstly rode round in a big circle a few times before trying the junctions that are painted on to the pad. It was here, when changing gear more I realised what had happened. Last time I was here, Mark had to move the biting point on the clutch as it was really far out and I only have dainty girly hands. I realised someone else had obviously been on Kay and the biting point was way back out again so I asked Mark to move it back in – sorted. We then checked the radios worked and headed straight out. It really was just like riding a bike – it all came swimming back. We were going to a completely different area of town to where I’d been before. Initially we were heading for the A45 Coventry Road, which I’d been on with Mark when we were on our country ride so I knew this bit but then it was in to the Heartlands, by the Heartlands Hospital and in and around Solihull. There’s some quite nice areas round here and it was nice to ride around. Most roads are 30mph, even a couple of dual carriageways. We also headed on to Stratford Road, which I recognised as I’d stayed down there last time I was here. There is really only a couple of 20mph areas, one is right by the test centre by a school. Ok, so it’s 20 by a school. But no, there’s another school and this is 30, and here’s another school and it’s 30! Ok, so it seems they care more about some of the children than others – I’m joking of course! We headed to a road to try out some U-Turns. There was no build up, we simply rode there and Mark said ok, U-Turn and then it was up to me. The first one I totally fluffed up – although not to anything like the degree I was a fortnight or so ago, it’s just that I ran out of gas and put my feet down and gave up. Right, let’s do this. 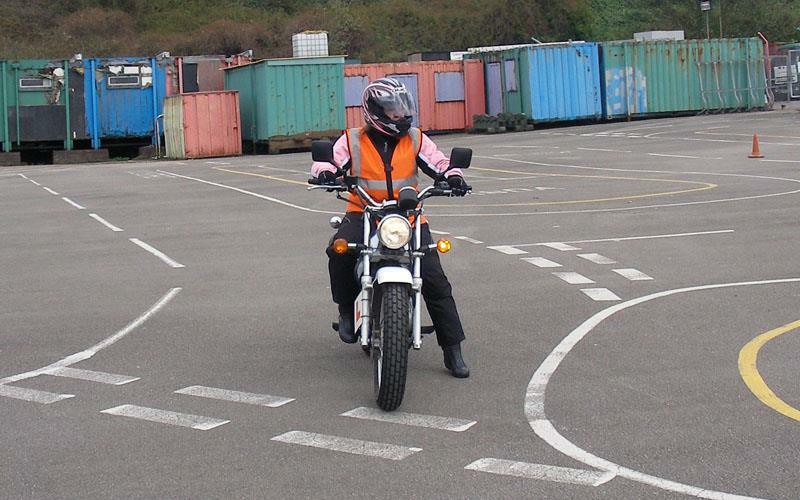 So I got on with it, thought about everything Mark had told me when he’d been teaching me the other week, revs up, biting point, slow riding, grip my knees with the tank, shoulder check and round you go – hooray! He then sent me round the block to try some emergency stops. Whereas I was really good at these before, I had to lose my mojo somewhere to compensate for the U-Turns and it seems this was the place. I was changing gear as I stopped, riding towards the curb before I had come to a complete standstill and was just cocking up. But practice makes perfect and they soon came back. There’s a couple of tricky junctions in this area really quick left, right turn, which totally caught me out and I was a bit jumpy on the first attempt but got it after a couple of times. Then there’s a junction, which is fine from one angle, but approaching from the other to turn right you can get your vision blocked with people turning in to this road. I had a few goes at that but it seems fine. Mark seemed happy enough with how I was doing and after a few more U-Turns – all successful, and a few emergency stops, we headed back to the BSM Training Centre for an early finish so that I wasn’t too tired before tomorrow. So here goes, the last night before my test, let’s hope I can get through this one successfully. I definitely feel more confident, more positive and like I’m far more in control with the motorcycle than I was even three weeks ago and I have Mark to thank for a huge part of that.